If you want to stay in the ultimate luxury,you'll need to spend $50,000 per night in the most expensive hotel suite in New York,the Ty Warner Penthouse at the Four Seasons.It's currently the most expensive hotel suite at the top of New York City's Four Seasons hotel,which offers a breathtaking 360-degree views of Manhattan and Central Park and it is also the highest hotel penthouse in the city standing 800 feet (244m) above the street. It was designed by architect I.M. Pei and designer Peter Marino. It covers the entire 52nd floor of the building and has a private elevator that leads guests directly to its amazing rooms. It's about a 4,300-square-foot suite and has nine rooms, including a 600-square-foot master bedroom,where you can sleep in Thai silk sheets. Cathedral ceilings, semi-precious stones in the bathroom, a grand piano,gold-colored Chinese onyx walls are some of the suite's benefits. The suite also features a spa equipped with a massage table, gym equipment and bamboo trees. There is also a Zen room equipped with a floor-to-ceiling waterfall and views of the Empire State Building.The price includes also spa treatments, meals plus complimentary caviar and champagne, a chauffer,butler and personal trainer.Although, now the price of the suite is $55,000 per night ,two years ago the price was lower at $ 45,000 and $ 35,000 a night , 6 years ago. 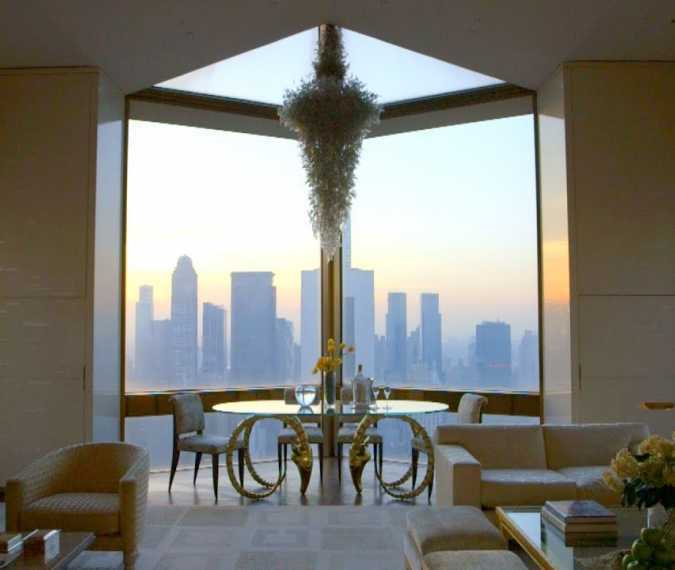 But if you are not a celebrity or a millionaire , at least take a look in the following video at this piece of architecture and luxury , the Ty Warner Penthouse in the Four Seasons Hotel in New York City and who khows ... maybe one day you will be there to enjoy a night at New York's most expensive hotel room.